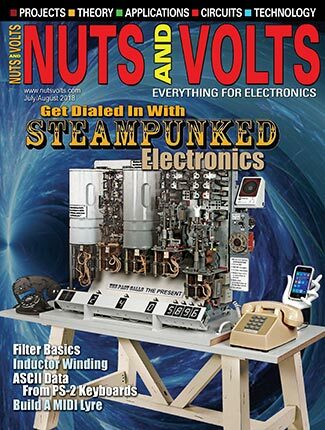 Smiley’s Workshop 25: AVR Memory - Part 3 — Program Memory In A Flash! We looked at this some in earlier articles but let’s revisit the concepts. A computer requires some sort of persistent binary memory for a program. It needs to be persistent so that when the power is turned off, the computer won’t forget what it is supposed to do. This persistent memory can be anything that can store binary data, from ordinary switches to rolls of paper tape. 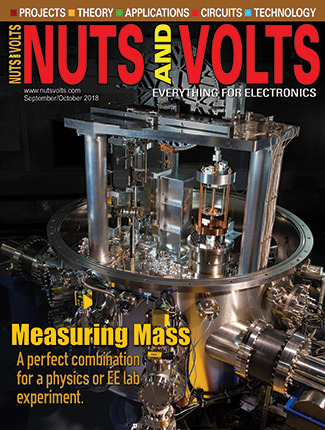 To get things moving fast, we need to use electrons. While these computer memories tend to evolve at computer speed, the sweet spot for persistent memory in microcontrollers is now occupied by Flash — a form of EEPROM (Electrically Erasable Programmable Read Only Memory). The big difference between regular EEPROM and Flash is that the regular kind can have individual bytes written or erased, while the Flash is written or erased in larger groups of bytes called pages. Since the erase/write circuitry is expensive (compared to the memory itself), using pages is considerably cheaper than bytes. The trick is to copy the page about to be written from the Flash to a section of RAM the same size as the page, change it in RAM, erase the Flash page, and then copy the data from the RAM back to the Flash page. We don’t need to understand much beyond that this process makes Flash a lot cheaper than other forms of reprogrammable persistent memory. The WinAVR toolset uses the venerable GCC compiler (that is arguably the most important piece of free software ever written). GCC is an acronym for GNU Compiler Collection and GNU is an acronym for ‘GNU Not Unix.’ If you like the idea that the text the acronym is based on contains the acronym — a concept known as recursion — you may well be a natural-born programmer. The WinAVR that we use with AVRStudio contains a version of GCC with specific tweeks to make it compile C to AVR assembly language. This is important because our compiler has to provide some not-so-portable methods so that we can use C most efficiently with the AVR memory architecture. Some of us find it very annoying when we give a computer a command and it second-guesses us. If you were a Vista user and you hate the Nanny messages, you might have gotten used to yelling at the terminal something like: ‘Of course I meant to press the @%$#*! * button. I pressed it, didn’t I?’ [Followed by a last thought: “Wait a second, did that say ‘self-destruct?’”] We aren’t concerned here with destroying ourselves. Instead, we want to know where the AVR is storing the strings it calls in response to button presses. The GCC compiler writes the assembly code to set up memory (including string storage) before the main() function runs, and it copies all variables to SRAM — even constant variables like our string. But wait — isn’t a constant variable some sort of oxymoron? Well, you’d think so but it is really a variable that just happens to not change in this particular program. In another program, the string could be printf (“Did you really mean to press the self-destruct button because you know that it means blowing us both up?”). Either string gets moved from cheap Flash to expensive SRAM and wastes resources — something we don’t want to do — so we have to learn special methods to get the compiler to leave the strings in Flash and let us read it from Flash. Of course, theoretically a compiler could figure out that the string isn’t changed in the program and could automatically set things up to read it out of Flash without transferring it to SRAM, however, our free GCC compiler doesn’t. (Before we complain, let’s remember the price.) We do however, have some methods that will let us keep the strings in Flash, and the avrlibc gives us some special functions that let us handle these strings almost like regular old C does. In addition to the GCC compiler, our WinAVR toolset provides avrlibc — a library that helps us make better use of C with the AVR. For using Flash, we find a number of useful macros and functions in pgmspace.h. The compiler will now leave the HELLO array in Flash and let us use it from there. The avrlibc provides a special set of string manipulation functions for use with Flash that are similar to those in string.h, but are in pgmspace.h and have a ‘_P’ appended to them. (For example, if we use strcmp_P().) This, of course, means that we aren’t using the standard C string library and our code is less portable. It’s a tradeoff well worth the sacrifice, though, if we are using the AVR with the free WinAVR toolset. 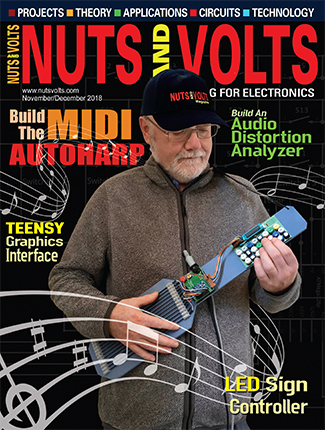 We’ll see how this works in our pgmtest.c demonstration program [available in Workshop25.zip at www.nutsvolts.com]. Now, please relax when reading this ... yes, there will be pointers. The first is the pointer FlashString which is set to point to a constant character; in our case, the first element of a string array. We then use it as an array with the subscript ‘i’ being incremented to indicate the specific character in the FlashString array; we add the ‘&’ ‘address of’ operator to get the specific address of the specific character at that position in the array. See ... that wasn’t so hard, was it? We want the loop to exit if one of two conditions occur. The loop will run as long as &FlashString[i] is true — meaning it is not equal to 0 and ‘i’ is less than 80. We do this because we terminate a string with 0x00 (the null character), so we want to end our loop if we see that character. We will also end the loop if ‘i’ gets up to 80, thus limiting our string size to 80 characters. This assures that the for loop will exit if we accidentally send it a pointer to an array that isn’t terminated by 0x00. FIGURE 1. pgmtest.hex with sections marked. When we compile our pgmtest.c program (we’ll do that later), the compiler generates several files. 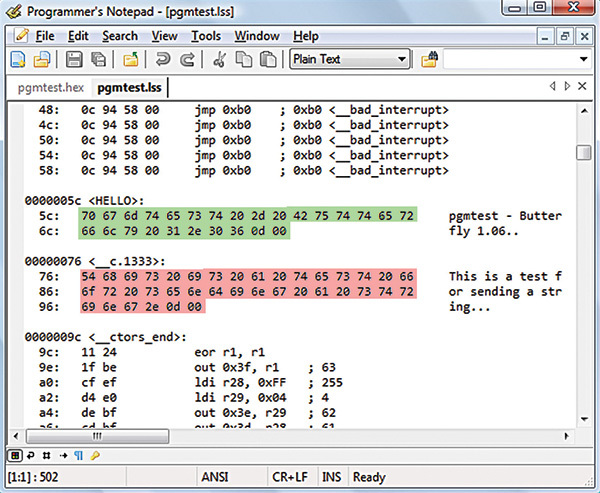 The pgmtest.hex file is the file we upload to our development board using the bootloader resident on the AVR. The pgmtest.hex file (in the source code default directory) contains the binary code for program in the form of an Intel hex file (shown in Figure 1). [Note that I’ve marked several lines in color because we will look at these later]. You can use Programmer’s Notepad [a great tool you can find in your WinAVR directory] to open the hex file. FIGURE 2. 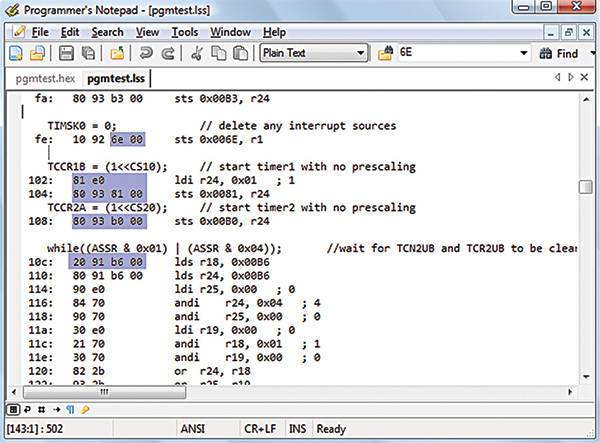 Intel hex format for pgmtest.hex data. Figure 2 shows how our data is formatted. Each line in the file begins with ‘:’ then ‘10’ to indicate that 0x10 (16 decimal) bytes of code are in the line. This is followed by two hex bytes that give the address that the code should be written to, followed by the 16 bytes to be written. The last byte in the line is a checksum. 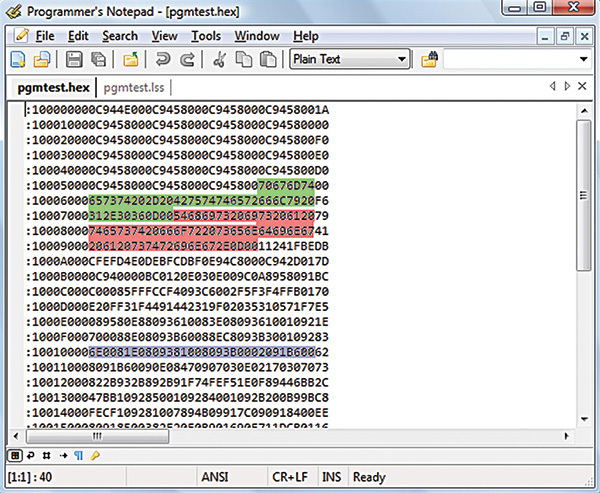 As you can see from Figure 1, I’ve marked three sections of the hex file. The green is for the data for the string: “pgmtest - Butterfly 1.06\r”. The pink is for “This is a test for sending a string.\r”.And the blue is 16 bytes beginning at memory location 0x0100 that we will read in the demonstration program. FIGURE 3. pgmtest.lss showing stored strings. In Figures 3 and 4 we look at the pgmtest.lss file that is also in the default directory along with pgmtest.hex. Figure 3 shows the green data that is stored beginning at address 0x005C, and the red data stored beginning at address 0x0076. You can see that the .lss file also shows the characters for the data to the right. In Figure 4 we see the 16 bytes of code that are stored beginning at address 0x0100 and to the right we see the assembly instructions that this code represents. Above the code we see the C instructions. The .lss can be very useful for debugging and for learning how the compiler translates our C code into the AVR assembly language. FIGURE 4. pgmtest.lss showing 16 bytes stored at address 0x0100. 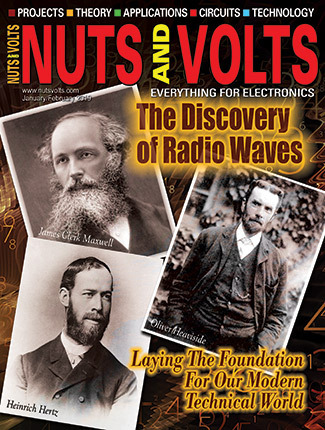 The full source code for this demonstration is included in Workshop25.zip on the NV site www.nutsvolts.com in the downloads. In this section, we will look at a few of the more relevant items. There are three main things going on here. First, we select the platform we want to compile our code for: either the Butterfly, the Arduino, or the BeAVR40. We remove the preprocessor comment delimiter \\ in front of the one we want to compile the code for. Note that we must also leave the \\ in front of the other two or we’ll get some strange errors. The second thing to note is that the include file SmileyUSART.h follows this define list. That is because the SmileyUSART header file needs to know which device is selected; the preprocessor writes the whole header file at this point in the code before it compiles it. [Aside: Note that the Butterfly baud is 19200 while the Arduino and BeAVR40 baud is 57600]. The third thing to note is that there are four HELLO character arrays, but only the one with the device defined for it is used by the preprocessor. The fourth is included in case none of the legitimate possibilities are defined. Download the pgmtest.hex to your device using the methods learned in the earlier Smiley’s Workshop(s) for that device. 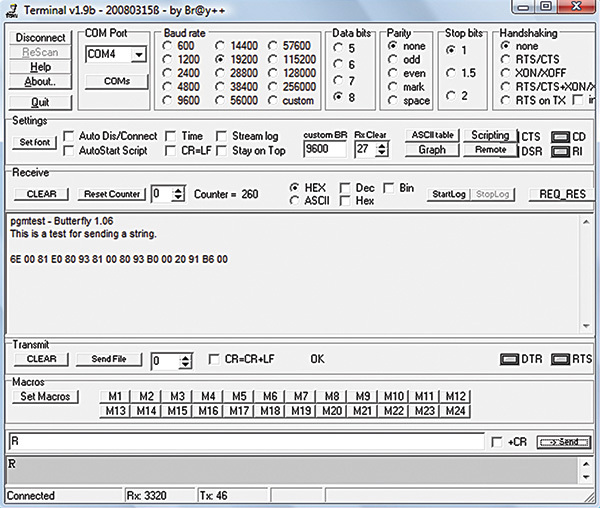 Notice that in Figure 5 the first two lines in the Receive window are in plain text, while the third line is a list of hexadecimal characters. To get Bray’s to show the data this way, you have to set the Receive window checkbox to ASCII when the pgmtest first opens; then you set it to HEX before you send the ‘R’ from the send window. This will show you the two strings and the line of hex code discussed above. FIGURE 5. pgmtest using Bray’s Terminal.